A couple of things are happening around, but not THAT much. First, I took your suggestions from the other day and put up an ad on the Scott Walker Hockey-reference.com page. Go check it out! 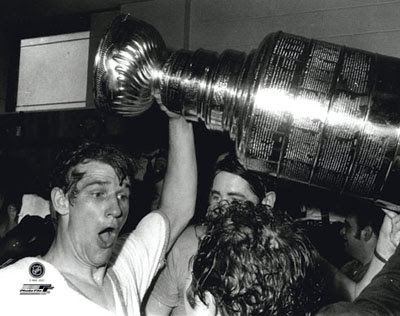 "We got the win, but more importantly I got to meet Bobby Orr." Wait, what? Hell yes. This is awesome. 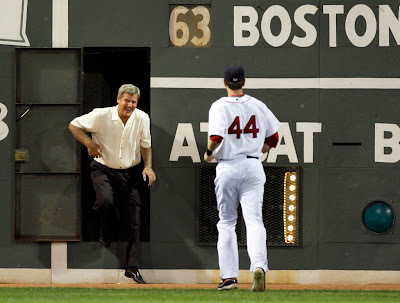 Right before the seventh, Bobby came out of the Green Monster and said hello to Jason Bay. They were apparently supposed to meet before the game, but didn't have time. This is better because we all get to see it. Sox and Dawgs has a video, to boot. 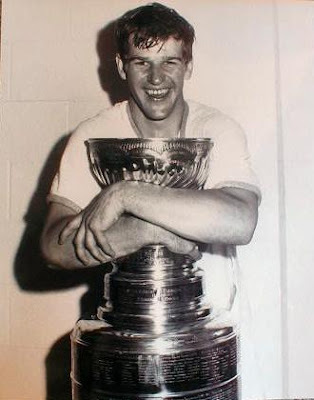 Bobby Orr smiling is one of the finer things in life. 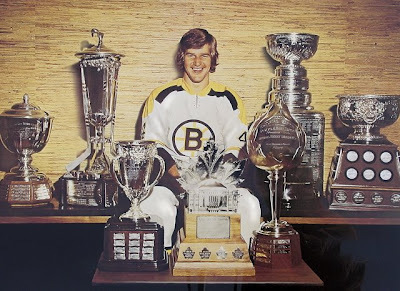 Here are some more pictures of that: The only NHL trophy Bobby Orr didn't win twice was rookie of the year. He sure did win 2 Stanley cups, though. Putting Boston in for 3rd-longest draught for cups of an original six team, in front of Toronto (1967) and Chicago (1965). Whatta Guy. Oh, and tonight is the NHL awards show. Tim Thomas, Zdeno Chara, and Claude Julien are all in Vegas right now getting ready to maybe win the Vezina (best goalie), Norris (best defenseman - Orr had 8 of these, which still stands as an all-time record), and the Jack Adams Award (best coach), respectively. Good luck to them! The awards show will be on Versus at 7:30 in the US, CBC at 8:30 in Canada. A hahaha Scott Walker, what a tool that guy is!